I stamped the pumpkins from the Hangin' Around stamp set in a row using my stamp-a-majig and then colored it and added some grass. 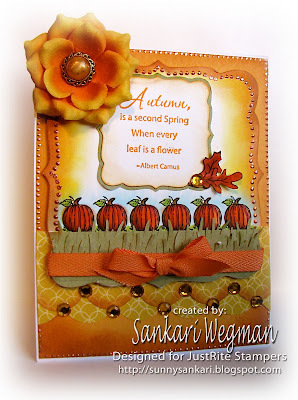 I stamped leaves from this stamp set by paper piecing them and adding them in the corner. I added the sentiment from the A Day In the Country stamp set which is filled with such lovely country scenes and sentiments. I finished by sponging the edges and adding a little bit of bling on the scalloped edging and tied it off with a bow. 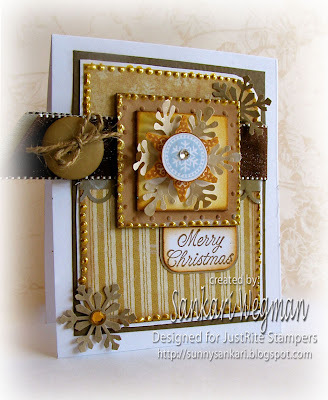 I saw a little flower from Prima that matched the colors of the card and added it with a little glue dot. 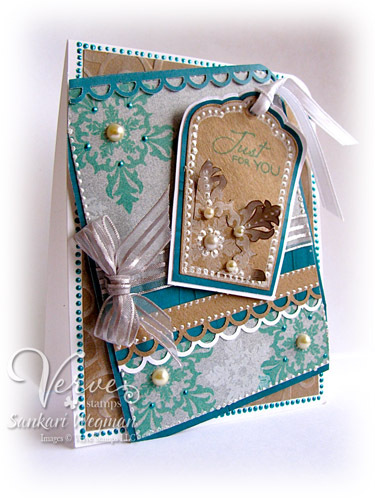 I love the way this card came together so quickly - I am really enjoying all the lovely new cling from JustRite - you can check out the JustRite blog for more details about all the new things going on! 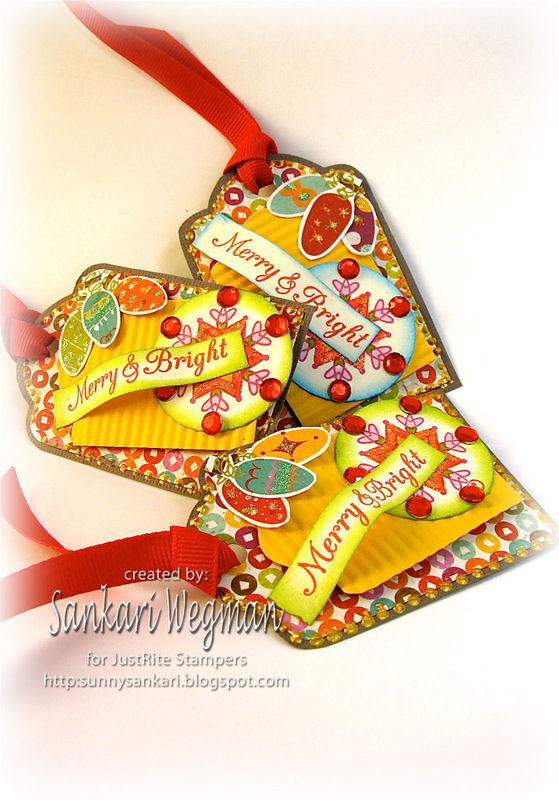 JustRite stamps just announced on the blog that they are coming out with a new line of JustRite Cling Stamps!!! These are red rubber stamps with cling cushion and are easily mountable onto your clear acrylic block. Today over at the JustRite stamps blog, Inchie Arts is the sponsor and the winner from this week's challenge will receive $50.00 worth of assorted Inchie Arts product and 3 honorable mention winners will receive $20.00 in Assorted Inchie Arts products! These matteboards come in 3 different sizes and fade resistant, acid free, lignin free and have a solid core (they are great for watercoloring, chalks, inks, pens, etc.) I couldn't wait to use mine with the sketch that is provided on this week's JustRite Friday challenge!!! I kinda tweaked the sketch a little and layered my Inchies together.. I took the bottom Inchie (1 and 1/2") and embossed it with my Swiss Dots and then sponged the 1" inchie with some yellow cream ink - I love how sturdy these inchies are how they add such an instant focal point to any card! 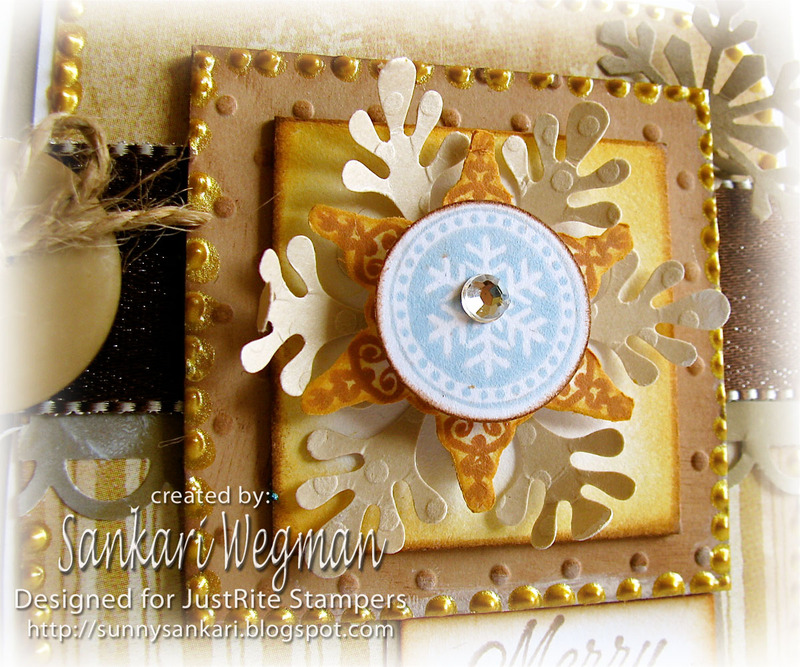 I used the snowflake from Sparky the Snowman and layered it with the smaller snowflake and sentiment from the Sparky and Friends stamp set. I wanted to keep a neutral palate to go along with the Inchies and I wanted to create a design that I could replicate very easily for my Christmas cards. I was so amazed at HOW quickly this card came together with the Inchies already cut and ready to go! I can't wait to get my Christmas card assembly going! I finished off the card with a button from my stash of button jars and twine from Ranger. Please hop on over to the JustRite blog to read more details about the cling rubber stamps, about the wonderful sponsorship from Inchie Arts and more details about this week's challenge!!! Hope you have a wonderful and safe halloween weekend! 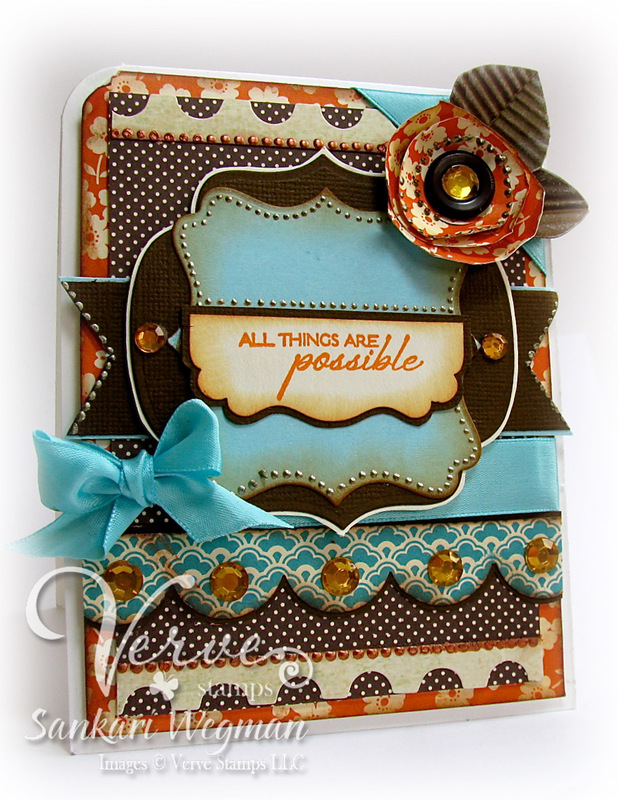 Welcome to the 5th day of the Verve New Release Spotlights where today we are showing and previewing one of the newest features that Verve stamps will be offering: Verve dies!!!! I can't even tell you HOW excited I was to be using the "A Cut Above" Verve Die for the Sweet Scallop tag (this tag die coordinates with two of the tag stamp sets from this month's release). Check out all the details about this newest feature from Julee over at the Verve Stamps Blog! I used one of the Spellbinder's labels and decorated it and added the word "Happy" and then using the Sweet Scalloped tag stamp, I stamped and cut out the image with the Sweet Scalloped die and then stamped it again but this time cut the inside part of the tie out and popped it up on dimensionals after a little sponging :) I Love the way that this Sweet Scalloped die cuts! 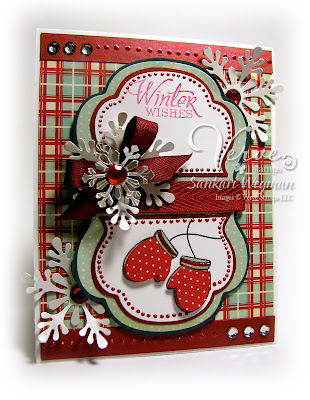 I seriously had waaaay to much fun making this card - the holiday music was on, I had a cup of fresh homemade chai next to me - and some time before everyone came back from school - talk about stamp therapy - just what the doctor ordered for cold and windy day!! 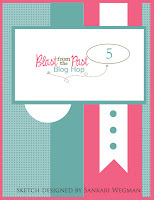 I simply loved creating this card, I know I am excited to hop on over and check out the amazing creations that the Divas have created for today's hop!!! 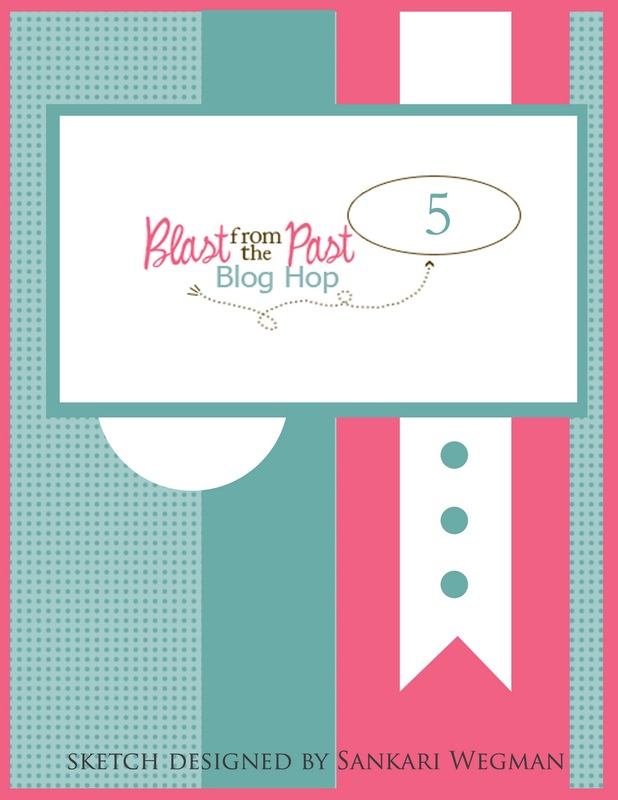 **** Plus, as with our other hops this week, we've hidden a PRIZE on one of the participating blogs, so leave a little comment love as you hop around to be entered into a drawing to win today's featured die and coordinating single stamp! Deadline for comment entries is 7PM Eastern tonight! Thank you so much for stopping by today!!!! And hope to see you at 9 pm EST in the Verve Forum for our Release Party! Everyday over at the Verve Blog, the Divas are peeking all the amazing creations that Julee has created for this fabulous release and today is Day 4 of the Verve New Release Spotlights, where today we are peeking the knockout gorgeous stamp set called: Glad Tidings which is seriously jam packed full of amazing images and sentiments - ohmyword!!! Here is a closer view of the tag - I also added some liquid pearls along with some Kaiser pearls onto of the snowflake. I added the sentiment "Just For You" and the tag and then matted it a few times with the colors of the card. 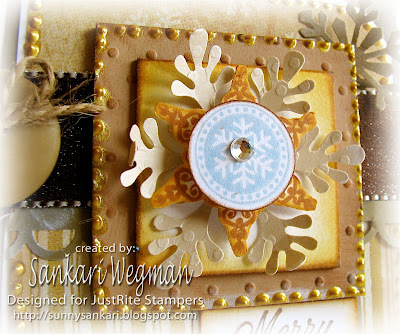 Here is a closer view of the tag - I also added some liquid pearls along with some Kaiser pearls onto of the snowflake - it was so much fun to cut out part of the snowflake on the tag and curled it over a bit :) I LOVED stamping with these gorgeous snowflakes. 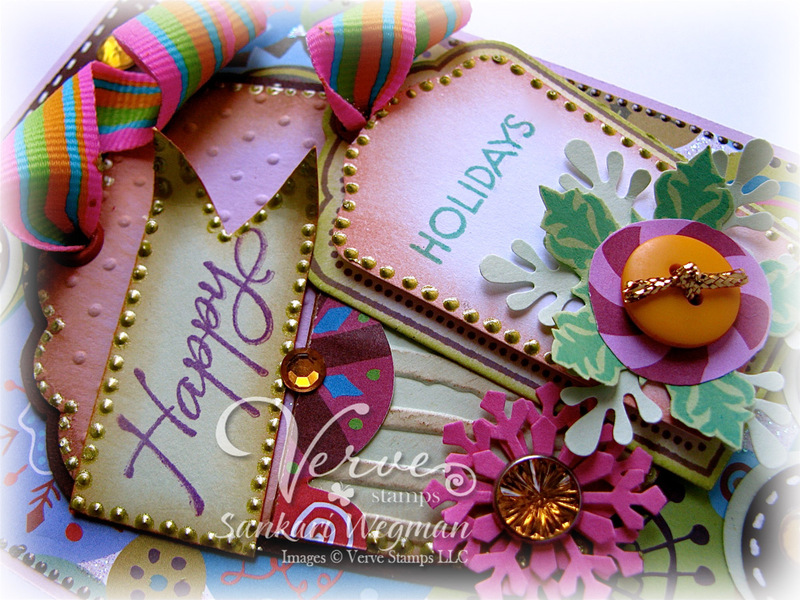 I can't wait to hop around and check out the gorgeous samples that the Divas have created for you today!!!! Thanks so much for stopping by today!!! Stop on by tomorrow for the last day of the Verve New Release Spotlight!!! Please come on by tomorrow !!! I finished the card off by adding the pennant border by hand cutting the triangle pattern that was on the Making Memories paper - I cut it out in such a way that it could be a pennant hanging (which I had to add a little bling to :) I can't wait to see all the lovely creations for today's blog hop - there are some amazing designers from some companies that are hopping along today!!! Please visit these designers’ blogs to see what fabulous JustRite Christmas inspiration they have for you on the hop today! Welcome to Day 3 of the Verve New Release Spotlights - today the Divas are peeking a beautiful stamp set called Merry Wishes and a gorgeous new tag called the Sweet Scalloped Tag. I love the sentiments and font in this gorgeous stamp set (especially the way that you can mix and match the sentiments! How awesome is that! For my sample peek today, I used this stamp set with the beautiful Vintage Oval Frame that was peeked yesterday. I love all these tags and frame that Julee has created - they make it so much fun to create and stamp sentiments and images in! 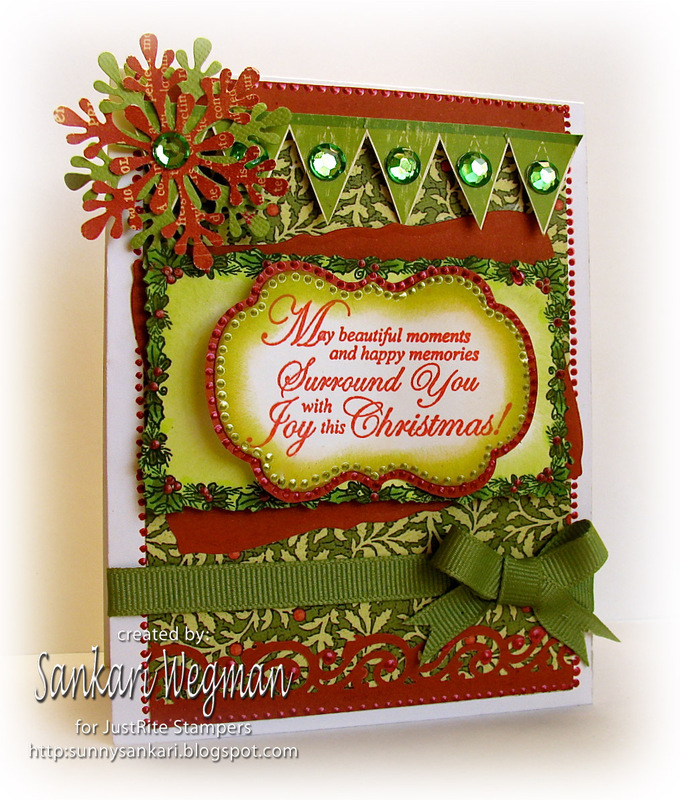 I chose the sentiment: "Joy to the World" and the whole time I was making this card, I was humming the song in my head. Accessories: Adirondack dimensional pearls (Lettuce) , ribbon from stash, cuttlebug embossing folder, vellum paper, Oval nesties from Spellbinders, EK success scalloped punch, bling from Want 2 Scrap and corner chomper. I know that you are in for a special treat as you hop along these amazing blogs filled with Vervey goodness!!! *** Don't forget that you could win some Verve-y stamps just by leaving a little love in the comment section of each blog! 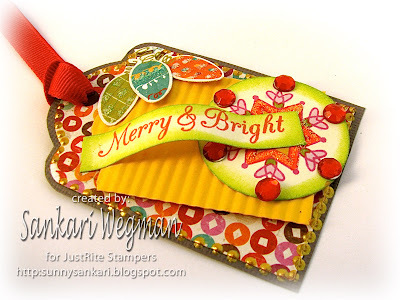 Hop on over with me and check out these gorgeously sweet Merry Wishes creations!! And come on back for Day 4 of sneak peek samples tomorrow!! I am so excited for Day 2 of sneak peeks for the newest release of Verve stamps (mark your calendar for the release party this Friday at 9pm EST over at SCS!). Yesterday the preview samples included 4 new stamp sets along with 2 Plain Janes!!! And Today, the party continues with 3 more stamp sets: Richly Blessed, Joy for the Journey and the Oval Frame stamp set!! For today's sneak peek sample, I couldn't wait to use the stamp set: Joy for the Journey - there are such beautiful and sweet sentiments and they are simply perfect for encouraging those you love on this lovely journey of life! I picked the sentiment: "all things are possible" its such a great sentiment - so inspiring and is perfect for so many occasions! I loved making this card and as i made it, i kinda daydreamed a little bit about all the things that I want to do and felt inspired to go for it!!!! Sankari <-- you are here :) ! Thanks so much for stopping by today!!! There's more Verve release yumminess tomorrow - so come on back!! This week is release week at Verve Stamps (WOOT!!!) 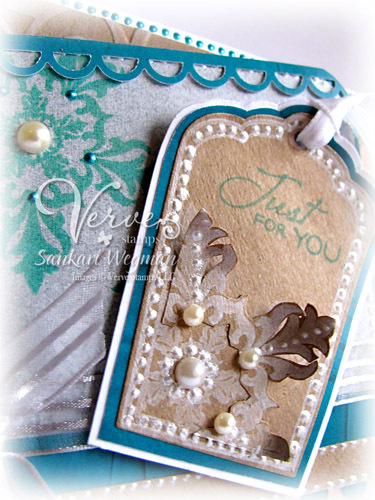 and each day on the Verve Blog the Divas are showing samples from all the gorgeous and beautiful stamps that Julee is releasing this Friday (Mark your calendars for the wonderful release day party on SCS at 9pm EST!!! Today the Divas will be sharing samples from 5 different stamp sets! : Winter Mittens, Holiday, Friendly and Munchkin pieces Stamp set!!! I wanted to use the stamp set: Winter Mittens because I couldn't wait to paper piece those mittens!! Using my nesties, I stamped the sentiment and mittens and arranged them using the Mitten Weather from Cosmo Cricket, I created the card below. Accessories: Kaiser Rhinestones, Cranberry dimensional pearls, Spellbinders, ribbon (twill), Martha Stewart snowflake punches, want2scrap bling, dimensionals. I loved making this fun card - and can't wait to meet more!!! I kept the layout pretty simple so that I wish I had mittens like that (that matched!) The sentiments and mittens are SO lovely to use IRL!! Julee is SO sweet and generous **** each day we will be giving away of one of the featured stamps that from each day to one random commenter :) There is a cut off for comments which is 7pm EST on Friday - and the winners will be announced that Friday night at the Release Partayaaaay! I can't wait to see what gorgeous samples the ladies have created!!!! Tomorrow is filled with more stamps sneak peeks - so come on by!!! I cut out a rectangle piece of with my nesties and then sponged one corner with some Summer Sky ink and then stamped the tree a few times on the bottom of the rectangle. 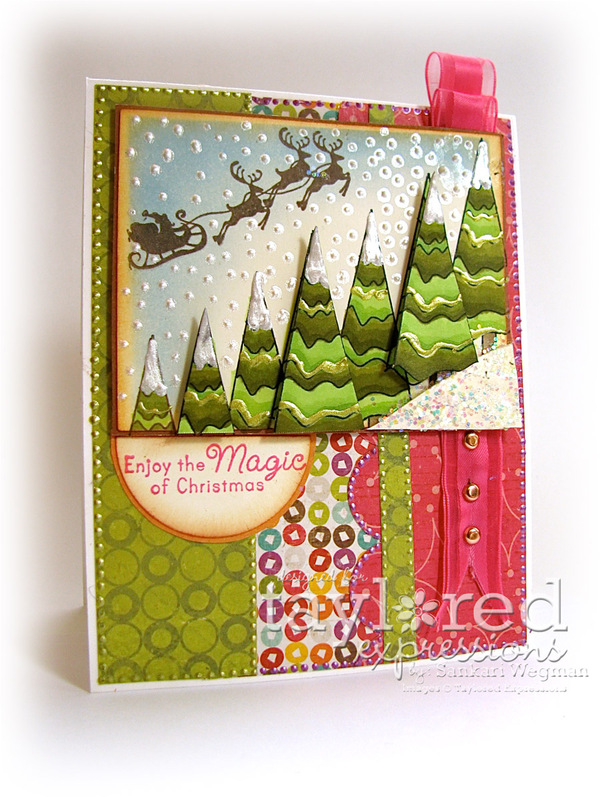 After coloring the trees in, I cut out a few more trees and then popped them up on dimensionals, stamped Santa and his reindeer from the Holiday Wonder stamp set and then added some snow with some liquid pearls. The sentiment is stamped and then punched out with a circle punch and added it under the image panel. I had so much fun creating this card and I can't wait to see what everyone has created for today's hop!!! Taylor is also giving away a PRIZE, where one random hopper will receive a FREE Taylored Expressions stamp set of choice and she will also be choosing another creation to be featured in the upcoming TE newsletter!!!! Stay tuned to Taylor's blog for more details of the next hop, but in the meantime, come on and hop with me!